Lomo Anamorphics and Phantom Miro capture "Ghost Hits"
In anticipation of the official release of their music video for “Ghost Hits”, Shake the Baron dropped some teasers, shot at 1000fps on the Phantom Miro. This is the sort of goofy fun that we had for two days of shooting, and what truly exemplifies the spirit of making music videos. “Ghost Hits” follows the story of a young couple that has run out of patience with each other and are arguing in the street, on the edge of breaking up with each other. As the fight intensifies, we are transported into an imaginary boxing ring, where they have it out in an intense match that leaves them bloody and exhausted. In the end, they realize they are meant to be together, and find within each other the love they truly feel. 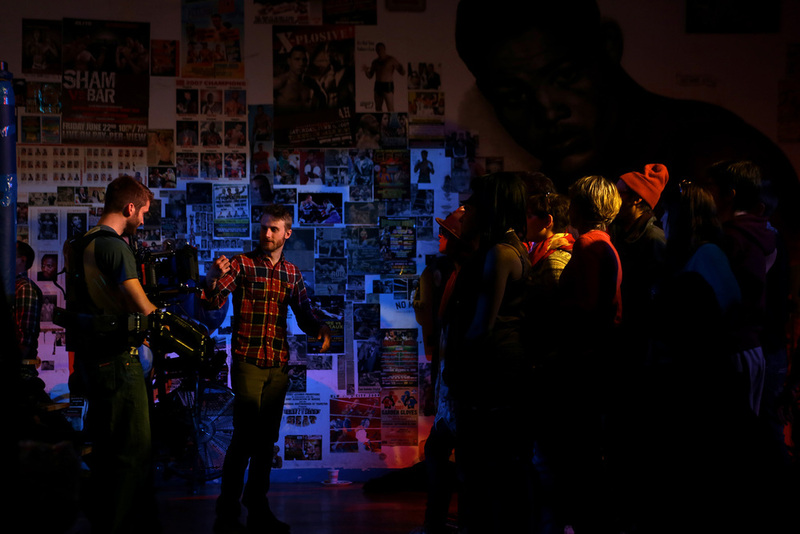 Director Alex Amoling approached me with a vision of 80s pop, bright, saturated colors, and constant camera movement. Coming from an editing background, he knew what he needed and knew he wanted a lot of it. The video has many beats as the song progresses, and we had to capture the brutal nature of the fight as the couple become more and more battered and sweaty. From the beginning it was no question that we would shoot with anamorphic lenses, and my set of Soviet Square Front Lomos fit the look perfectly. They have beautiful flares and take the “digital” edge off the Epic, providing a more organic and film-like image along with a cinematic 2.35:1 aspect ratio. The first day was handheld in the backyard of the band’s home, where we captured an intro where guitarist/vocalist Andrew Oedel knocks out his bandmate, guitarist Jon Markson, with a swift punch to the jaw. We are then transported under the raised subway tracks in Bushwick where Andrew and his girlfriend have it out on the street. We used this time to shoot both Epic and Phantom, and managed to squeeze in a few shenanigans for the promos - mostly people getting punched or antiqued at 1000fps. Everything was shot using only available light. 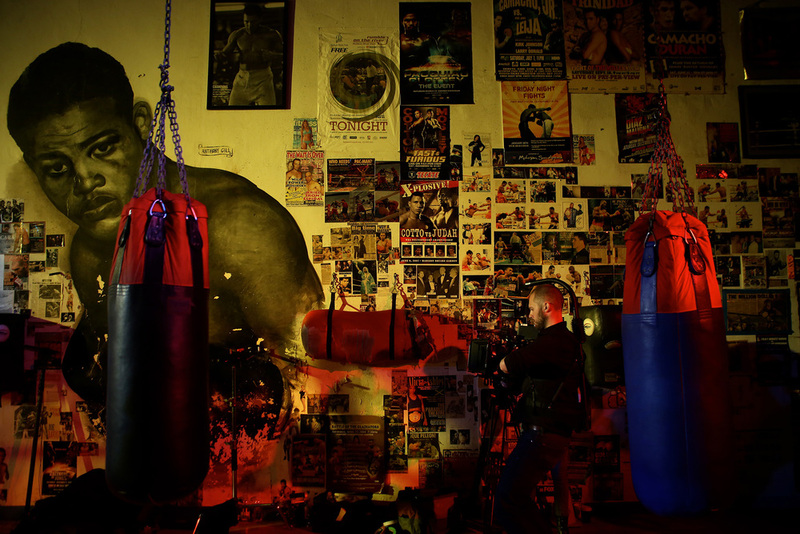 The following day, we were down in the basement of a building on Church Street in Lower Manhattan, which housed an impressive boxing ring and walls covered in boxing history. It was visually perfect, but logistical hell. We were three floors down with no elevator and not much more than a few scattered 20amp circuits. This is where Gaffer Freddy Cintron came in. During our tech scout, Freddy came with Alex and I to discuss the look and figure out what we would need. Since we were shooting 1000fps alongside two Epics at varying framerates, we knew we would need a lot of light, which meant a lot of power. We had three separate spaces to light - the locker room, the hallway and the ring. The first two were simple: the locker room was lit with a variety of KinoFlo units with daylight bulbs and gelled with Steel Blue. The hallway was similar, however we used several KinoFlo Mega (8ft) lamps skinned in Flame Red. Existing practicals were gelled with Apricot, and we allowed the alternating colors and positions of the lamps to create a dynamic light movement across our band members. Eventually, we get to the ring, and this was the biggest logistical obstacle to overcome. The space was lit by a combination of 40 Lekos, Source 4 Pars and Par Cans, gelled with Light Amber, Middle Rose, Peacock and other colors. We also had 2 10K fresnels on crank stands which would be wheeled in for Phantom shots. Outside, we had a 1200amp van generator with several hundred feet of five-wire cable running down the three stories and distributed around set to power all of this heat. As this was a relatively large scale production, and that we were shooting while the crew was prelighting the ring, credit goes to Freddy for being able to work independently and efficiently to set up and create much of the lighting. Once in the ring, Steadicam Operator Kyle Wullschlegger ran around with an Epic and 35mm Lomo lens, and I was right next to him handheld on the 80mm picking off details. Without the two cameras, we would never have shot enough footage in the time we had. ACs Erik Kandefer and Andrea Romansky rolled with the punches and kept the cameras running and in focus, while DIT Sam Gursky dealt with an influx of data from three cameras. For slow-motion shots requiring Phantom, we would wheel in the 10Ks and I would line up the shot handheld. Since we were shooting 1000fps, I pulled my own focus (or not at all). I used the Miro with Canon mount, and shot on the Rokinon Cine Primes - mostly on the 24mm or 35mm. These allowed me to open up to a T1.5, giving us those extra precious stops to achieve a matching exposure to the Epics. This was the most fun, as there’s nothing like seeing your shot play back in super slow motion while a crowd looks on, cheering during every face hit. Director Alex Amoling kept the pace up all day, pushing us to work faster and shoot more. He was adamant about getting all of the proper story beats, and it was a fun and challenging keeping up with him while making it look as good as possible. Luckily, we had planned well to be able to shoot 360, and we cranked through an ungodly amount of setups in roughly 9 hours of shooting. Once cut together, we graded at Company 3, where Colorist Jaime OBradovich was able to bring up the saturation, pop skintones and match the cameras together. Using a combination of proprietary LUTs and pure talent, Jaime was able to add the final polish to a piece I can only describe as a massively successful collaboration. Special thanks to Mike Nichols and Abel Cine New York for the Phantom gear and continued support. Stay tuned for the official release of Shake the Baron “Ghost Hits”.